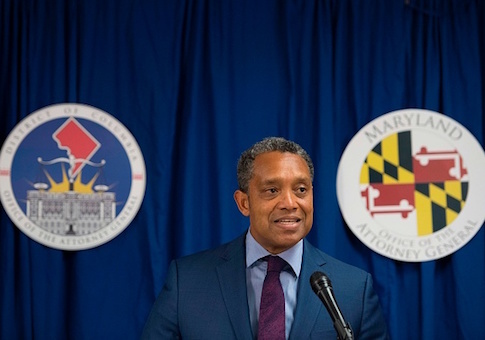 A D.C.-based think tank filed suit Wednesday against D.C. Attorney General Karl Racine, claiming his office has refused to produce any kind of response to several Freedom of Information Act requests seeking documents related to an environmental legal scheme largely funded by former New York City Mayor Michael Bloomberg. In that scheme, Bloomberg funded a new "center" of the New York University School of Law, and the school provides the funding for certain attorneys to be placed within attorney general offices (OAGs) around the country with the sole purpose of pursuing litigation and other legal work related to climate change. The payment for these attorneys includes their ongoing salaries, so that the OAGs are able to essentially add an extra full-time staff member without having to dip into their budget. The Competitive Enterprise Institute, which has led the way in obtaining records to uncover the activities across the country, filed the suit asking a judge to compel Racine's office to fully comply with the requests made under the district's Freedom of Information Act (FOIA), which closely mirrors the federal law of the same name. Chris Horner, a senior fellow at CEI, estimates at least 10 such attorneys are known to have been placed with AG offices in Oregon, D.C., New York, Massachusetts, Maryland, Illinois, New Mexico, and Washington. CEI said in a press release that it is certain Racine's office is in possession of the requests because various emails confirmed receiving them. However, CEI further claims there's been no other communication, which would at least typically acknowledge that some documents exist and provide a timeline for when they will be produced. The first of the FOIA requests by CEI stretches all the way back to October of 2016. But the bulk of the remaining requests at issue date from February to July of this year. Media officials in Racine's office did not immediately respond to a request for comment on the lawsuit. Horner told the Washington Free Beacon the public should be concerned when a lawsuit such as this has to be filed against an attorney general. "An AG refusing to comply with these laws suggests an even greater intention to hide public information from scrutiny than found in your standard FOIA stonewall," he said. In August of this year, Horner and CEI published their findings on the efforts in a paper titled, "Law Enforcement for Rent." Later, the Wall Street Journal editorial pages weighed in on the situation. "The ethical problems here should be obvious. Private interests are leveraging the police powers of the state to pursue their political agenda, while a government official is letting private interests appear to influence enforcement decisions. None of this is reassuring about the fair administration of justice," the paper said. Horner and CEI have argued that it may be illegal in some or all of the jurisdictions for the OAGs to accept attorneys whose salaries are paid for by outside entities, because in most situations, an AG's office is funded by the respective legislative body. And the funding mechanism is generally understood as a "check" on the law enforcement agency's powers. About a month after CEI issued its full report, the Free Beacon obtained a document showing that lawyers for the Oregon legislature analyzed the situation, and concluded that the outside funding of an attorney working within the Oregon Department of Justice was likely not allowed under state statute. That summary was only an advisory, however, and was not legally binding in any way.